There is no need to soak the fruit overnight so it's much faster to prepare - it's also ready to eat as soon as it's cooled. 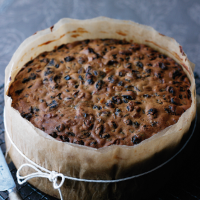 It's so deliciously rich and fruity that no one will guess you've made it so quickly! 1. Place all the fruits, butter, sugar, chestnut spread, brandy, lemon zest, clementine zest and juice into a large pan and bring slowly to the boil, stirring until the butter melts. Simmer gently for about 10 minutes, then remove from the heat and allow to stand for at least 35 minutes. 3. Preheat the oven to 150°C, gas mark 2. Tip the cooled, soaked fruit into a large mixing bowl. Stir in the beaten eggs, sieve in the flour, baking powder and spices and mix well, until thoroughly combined. Pour into the prepared tin and bake in the oven for 3-4 hours, or until the top of the cake is a little cracked and dry to touch. A skewer inserted into the cake will still come out a little sticky, but the cake will be ready. Discard the brown paper from around the tin, to allow the cake to cool more quickly. Spike the top with a cocktail stick and drizzle over the remaining cherry brandy. 4. When the cake has cooled completely, remove from the tin and place on a board.